MAP: Help for Our Health, Anytime We Need - Perelandra Ltd.
Another battle ensues over health insurance in the U.S. While Congress debates how and if to provide basic health care to everyone, we have to figure out how best to care for ourselves and our families. Many of us are once again watching our access to medical care being thrown into the air, without any clue of how it might land. What can you do to shore yourself up while this gets hammered out? Over the next few weeks, we'll be highlighting some Perelandra basics for strengthening your health, for adding unique support to your self-care and for maintaining your balance. We start here with the simplest, most comprehensive and inexpensive way to shore up and expand your health care. MAP is available to anyone, anywhere in the world. All you need is the book with complete instructions. This Medical Assistance Program offers physical, emotional and mental health support. It's personalized and private, and has helped folks around the world for nearly thirty years. It's comprehensive health care, available to you on your schedule. The program is a process, a procedure, a way of connecting with, talking to and addressing your health issues with an expert medical team in the White Brotherhood, including nature intelligence. Before we go further, we want to address something that can be a big hurdle for folks. 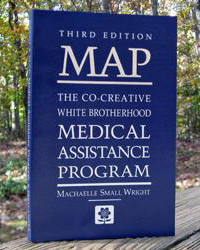 MAP is the acronym for the Co-Creative White Brotherhood Medical Assistance Program. We understand the term White Brotherhood can raise serious questions and bring up thoughts of white supremacist and sexist movements that are painfully all too often in the news these days. We want to be absolutely clear about this. The White Brotherhood we are referring to is NOT some white supremacist or sexist organization. This term was coined centuries ago. "White" signifies the reflection of all rays of the light spectrum and "Brotherhood" signifies the family of all life. And we want you to know, if the name White Brotherhood sticks in your throat and offends you, regardless of its history and significance, you don't have to use that term when working with your MAP team. Machaelle explains exactly how to get around this in the book. The focus in MAP is your health and well-being. Nothing more, nothing less. When you follow the easy, clearly written steps in the MAP book, the medical department of the White Brotherhood has the opportunity to help you address your health concerns. You can talk to your MAP team about any health issue. Read an excerpt from MAP here. And discover how others have gotten help from MAP, through their own words here.